Some Windows users who are connecting via wireless lan to the Internet may have noticed regular ping spikes and sometimes even disconnects due to an automated background scan. Especially Windows Vista users have been plagued by this issue, but it has also been reported by users running Windows XP or Windows 7. You can test if your wireless connection is having regular lags by opening the Windows command line (Windows-r, type cmd, hit enter) and use the ping command to ping a local or remote IP address (e.g. ping -t 192.168.1.1). If you see time spikes you are affected by the issue. The WLAN AutoConfig service is responsible for the scans which are executed even if the computer is already connected to a wireless network. Users have reported connection issues for up to five seconds during scans which is especially problematic for Internet gamers and users who use streaming media services. It is not possible to disable the WLAN AutoConfig service right away, as it is needed to establish the connection. The free software program WLAN Optimizer resolves the issue by disabling background scans once a wireless connection has been made. The portable program displays all options in two tabs in its interface. 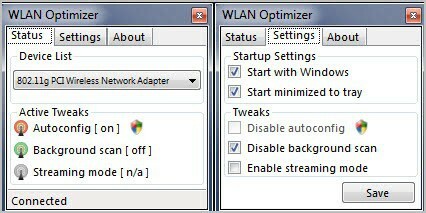 The status tab displays a pulldown wireless network adapter selection menu and the status of the tweaks the program offers. The settings tab displays options to enable background scan and streaming mode. It is not recommended to disable autoconfig in the menu, but the option is available. WLAN Optimizer is however not the only software that disables wireless background scans. The free tool VBGScan is also capable of disabling the scans. It has been developed for Vista, and it is not clear if it works under Windows 7 as well. Especially Windows Vista users have been plagued by this issue, but it has also been reported by users running Windows XP or Windows Vista. You are so right, corrected. Thanks! The programs you mentioned Martin, are they just run once because if just makes some registry changes or do they need to run in the background? IIRC, they need to be run every time a connection is established.